074. ENDURANCE, Issued by Mills (Amalgamated Tobacco Corporation (South Africa) Ltd.) (1952). Card number 1 from a second set of 25 entitled "Famous British Ships". Size: Ca. 2.96" x 1.92". 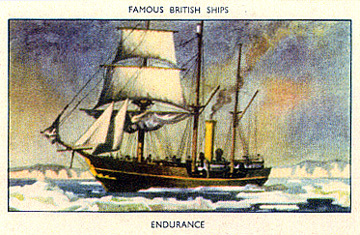 Recto: View of Endurance among ice. At the top: Famous British Ships. At the bottom: Endurance.